A huge amount of Chinese restaurant websites fail to properly display on smartphones and tables, according to a November 2018 study from StormSector.com. Menu images were missing or cutoff from the screen, text couldn’t be read at all, no menu was viewable, and navigation was difficult to impossible for small mobile devices. This ultimately hurts your income potential and annoys your loyal customers. A good restaurant makes sure their menu is easily accessible and their website properly displays on as many devices as possible. A majority of people view the menu from a tablet or smartphone device. It’s important to fix these issues to help your business. Storm Sector uses responsive design techniques to address mobility issues that are often due to outdated website coding and design content. If you have an outdated website that isn’t correctly displaying on mobile devices, we can help. In October and November of 2018, Storm Sector, LLC polled Google Maps to detect the websites of over 242 Florida Chinese restaurants. They were individually viewed by staff on an Android tablet and smartphone to determine 1. If the main website fit within the margins of the screen, 2. The content could be read/seen (text/images), and 3. The menu or navigation was easy to use. A majority of these restaurant websites failed the test. Results were compiled in Excel and reduced for a total number of 201 because some were out of business. About 135 of the websites failed the test for all three test areas. Some restaurants didn’t even have a menu that could be seen or downloaded! Smartphones and tablets are becoming even more important for business owners. Specifically, the restaurant industry is seeing more mobile users. They search for your phone number, directions, menu, and specials. But, unfortunately, many restaurants have outdated websites that aren’t displaying properly on these devices – so your potential customers can’t find you. In fact, as of 2016, there was also a report that more than 25% of customers have a restaurant app installed on their phone. This number will continue to increase. It’s convenient to tap on your phone to get information you need, view a menu, make reservations, or see coupons. There are hundreds of millions of mobile devices – an untapped market of income potential for your business. You must have an interoperable, mobile-capable website to reach these people. Web designers call this a responsive website design. It means no matter what people use to view your website your website automatically adapts its content to display for them. Do you have this for your business? Storm Sector, LLC fixes your outdated website designs so you’ll have a new website that can display on nearly all modern mobile devices. We make sure a single website design can easily display on tablets, smartphones, televisions, desktops, and laptops. It’s a matter of imagination, coding, layout, brand personality, and expertise. 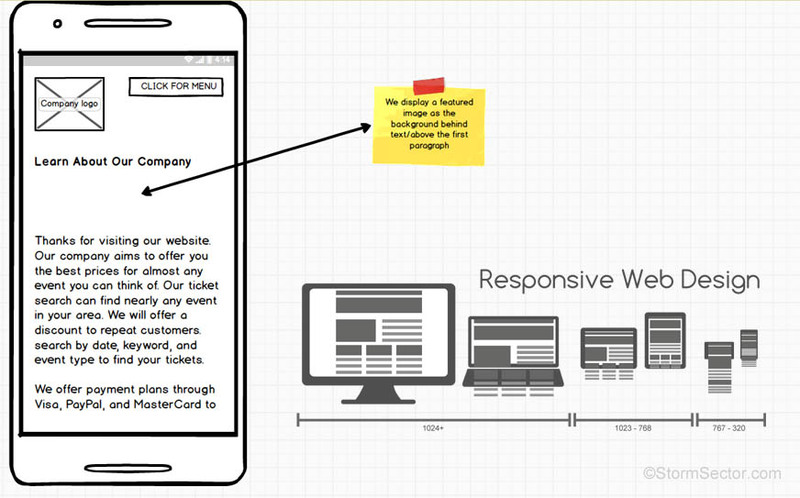 Our responsive design service ensures you reach more customers. Happy customers like content they can see, access quickly, and depend on to answer common questions like prices, location, hours, and coupons. The restaurant industry has a lot of bad website designs that hurt their business. Make sure you’re not running a business website with outdated designs, graphics, or poor content. We can help you on a budget! We fix outdated websites. We fix your website so it will display much better on tablets and smartphones. Need help? Check out Storm Sector, LLC web design and development services for questions, pricing, and specials. New Product or Service Coming to Market?